We can already see clear signs of the fulfillment of the four prophecies conveyed by Our Lady of Fatima: war, famine, persecution of the Church and persecution of the Holy Father. 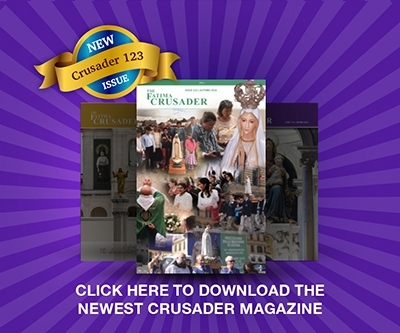 The first chastisement predicted, war, began to be fulfilled with the Second World War, and is continuing to be fulfilled through the many wars that are being fought across the world every day. And despite the attempts of various international bodies and other groups and individuals to bring about an end to war, the fighting and killing goes on. Although war is a common experience for mankind  with more than 14,000 wars being fought in 6,000 years of recorded history — mankind has lately entered into a new, and far more dangerous and destructive, era of warfare. Today the potential for annihilation is far greater than ever before due to two relatively recent developments in the tactics for fighting wars: 1) the concept and practice of total war (where civilians are no longer excluded, in principle, as “legitimate” targets of the enemy) — something never seen before the 19th Century — and 2) the development, justification, and usage of Weapons of Mass Destruction (WMD). It has already been demonstrated that one bomb can completely annihilate a major city, killing hundreds of thousands — or, perhaps, even millions — of people instantly and indiscriminately. Today there exists enough Weapons of Mass Destruction — atom bombs, neutron bombs, hydrogen bombs, etc. — to wipe out all humanity many times over. This, obviously, makes mankinds situation much more precarious than in previous ages. Our only way out of this dilemma is the Consecration of Russia. The third chastisement, persecution of the Church, is evident to all, Catholic and non-Catholic alike. The Catholic Church is undergoing a terrible persecution, and is attacked constantly in Her moral teaching, Her doctrine and Her members, especially by forces wishing to destroy Gods reign in souls. The destruction being wrought in the Church is a chastisement upon the entire world because the Church, so oppressed internally and externally, finds it difficult to bring about this consecration of Russia. This lack of compliance results in the ongoing wars that afflict the world. The Church is also suffering because of the fourth chastisement predicted by Our Lady of Fatima: the persecution of the Holy Father. The Holy Father is persecuted by both members of the Church and by those outside of the Church, and the Church is very much affected by his sufferings. The Holy Fathers legitimate commands are very often ridiculed and ignored, even by his own clergy and flock. Oftentimes, the Popes legitimate attempts to govern the increasingly dissident Church are undermined by those around him, and his efforts are thwarted. Thus the four prophecies predicted by Our Lady of Fatima are being fulfilled. Yet, as Our Lord told Sister Lucy, “It is never too late to have recourse to Jesus and Mary.” It is not too late. God still awaits the Consecration of Russia to the Immaculate Heart of Mary. He still wants us to work to spread devotion to the Immaculate Heart, and to make reparation to Her through the Communion of Reparation on the First Saturdays.